Thanksgiving dinner isn’t Thanksgiving dinner without a side of sweet potato casserole. 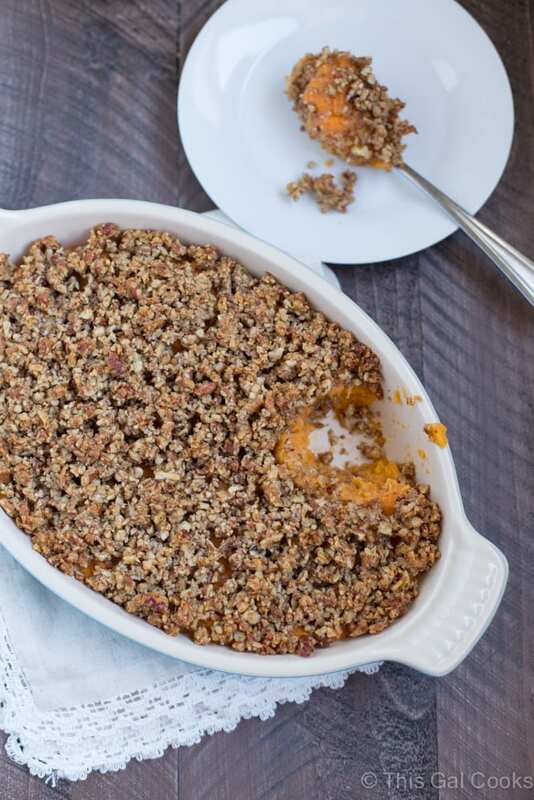 Who needs marshmallow topping when you can have sweet and crunchy pecan streusel topping your sweet potato casserole? Hello and Happy Tuesday! 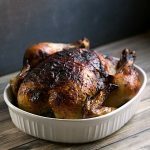 Are you ready for Turkey Day aka Thanksgiving? A couple weeks ago I made a few changes to my most favorite sweet potato casserole recipe. I added eggs and coconut milk to the mashed sweet potatoes, reduced the sugar and left out the cinnamon and then I took new photos. 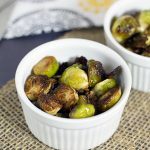 I think the recipe tastes incredible with the revisions so I’m sharing the updated recipe with you today. This week has been one darn busy week. On Sunday I spent the entire day cooking a mock Thanksgiving dinner. And between a group project at school and the increase of work at my job, I feel like I am about to explode! I already have 2 1/2 hours of overtime this week. Today will probably make it 3 or more hours. But I’m fine with that. For now. The extra money is always nice. How has your week been? One of my favorite side dishes for any holiday meal is sweet potato casserole. It’s such a simple dish to make and it tastes amazing. The flavors remind me of Thanksgiving and Christmas dinner. My mom always makes it topped with marshmallows and I absolutely love it! But as much as I love marshmallow topped sweet potato casserole, I wanted to try something different this year. Pecan streusel sounded like a perfect fit for the casserole! Wash the sweet potatoes and place on the prepared baking sheet. Bake 40-45 minutes or until the sweet potatoes are soft. Remove the potatoes from their skins and place in a mixing bowl. Add ¼ C butter, 3 tbsp brown sugar, beaten egg and coconut milk. Mash together and then stir until combined. In a food processor, combine the pecans, 2 tbsp brown sugar a pinch of cinnamon and butter. Pulsate until combined. Place the sweet potatoes in a lightly greased 1.5 qt baking dish and top with the pecan mixture. Bake at 350 for 30-40 minutes or until the pecan topping is golden. To cut back on time, you may microwave the sweet potatoes. Use the potato setting on your microwave and enter 4 for the number of sweet potatoes you are cooking. This is the only way I make sweet potato casserole. Yours is gorgeous! 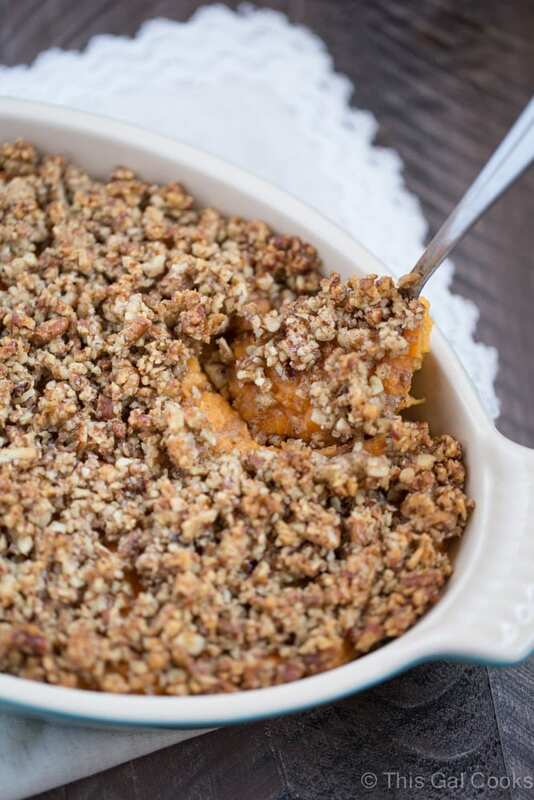 Sweet potato casserole is a must at our thanksgiving table no matter how many people are involved! I love it this way!! We dropped the marshmallows a long time ago! Looks great!! this looks incredible! I look a good Sweet Potato casserole! This may be my new favorite Thanksgiving dish. Even though I haven’t tried it yet, I know I will love it. 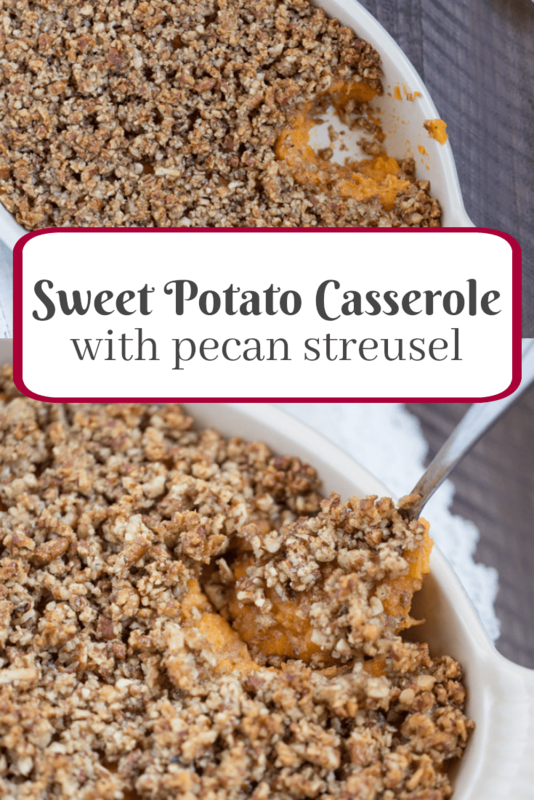 I love sweet potatoes and you know how I love pecans! Thanks for sharing, Julie! Have a great weekend! The pecans sound like a great switch for the marshmallows. My husband is English and the first Thanksgiving he spent with my parents was an eye opener for him. He couldn’t believe that we put marshmallows on a vegetable! He still won’t eat them but I love sweet potatoes and make some version for myself every year. This looks delicious. Love the topping. We’re celebrating Thanksgiving at Saturday Dishes. I’d love it if you linked this. Julie, this looks SO good! I love sweet potatoes and could just dive right in! :) Thanks so much for joining us and sharing at Best of the Weekend – pinning and sharing! Hope you have a happy Sunday! Love it, so full of flavor. The pecan streusel sounds mighty delicious. 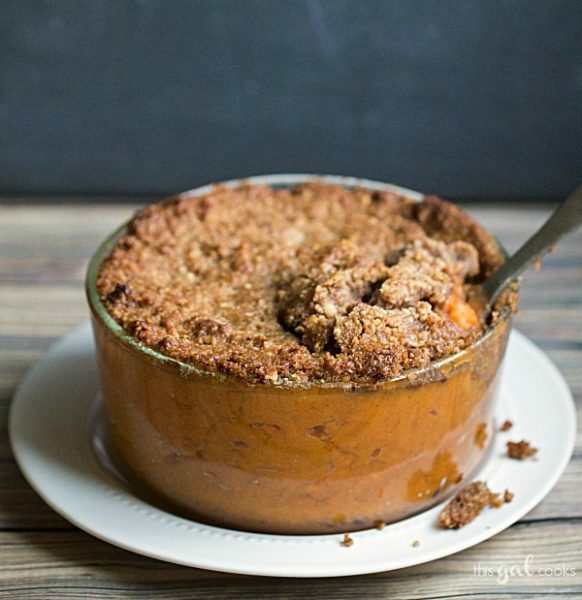 I love that you gave this Fall ready casserole a streusel topping! My belly is growing in hunger just looking at it! Looks amazing Julie! I love sweet potatoes and I’m all ways looking for new ways to cook with them. I definitely think I’m going to try this one! Thanks! I love this! In the recipe you call for 1/4 cup of butter room temperature for the topping, but you didn’t include this ingredient in the food processor. Is it supposed to go in the food processor? Or did you not use it in the topping? Thanks so much! My computer crashed last year which had my recipe in it and this looks like the same recipe. Thanks so much! Thanks for catching that! You would add it to the food processor when combining the pecans, brown sugar and cinnamon. 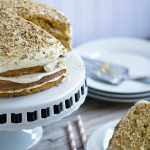 I’ve updated the recipe! The recipe looks good, but microwave the sweet potatoes?!!? If you want real flavor from a sweet potato it needs to be wrapped in foil and roasted in a 450 degree oven until it is soft enough to run a skewer through. That way the sugar caramelizes and you get lots of delicious sweet syrup which adds a ton of flavor. 45 minutes to an hour should be enough for a good sized potato. Skip the microwave and roast the potatoes – it’s worth the extra time. I’ve actually baked sweet potatoes many times. I’ve also grilled them. But when you are cooking a ton of stuff or if you don’t have an hour or more to wait for potatoes to oven bake, microwaving works just fine. I get crazy when it comes to sweet potatoes – one of my absolute favorite foods (sweet potato biscuits are incredible when done right), so to me microwaving a sweet potato is like boiling a steak :-) Gotta have that Maillard reaction in the oven! But you are absolutely right that when pressed for time the microwave will do the trick for sure. Oh my gosh! Boiling a steak?! That’s a crime! I only like my steaks grilled. I don’t even like them cooked on a skillet on a stove. I peel and dice the sweet potatoes, drizzle with either olive oil or grapeseed oil and then season with a little brown sugar and cinnamon. We put the potatoes in a grill wok and then grill them. My boyfriend actually does the grilling part so I am not sure what he has the grill set at and whether or not he uses indirect or direct heat. I will find out! I love sweet potatoes and am definitely going to try this! Your picture is stunning too! Sweet potatoes are one of my favorite foods. Love this version you created Julie! can you make this all the night before and just put the casserole in the oven that day ? I cannot say for sure how it will turn out with prior day prep as I have never made the casserole this way. My suggestion would be to prep and bake prior to the day you are serving it and then reheat the day you are serving it. I hope this helps!